It's Friday! It's Friday, and I'm about to take a little blogging break. Fear not! I'll be back with lots of photos from my travels. 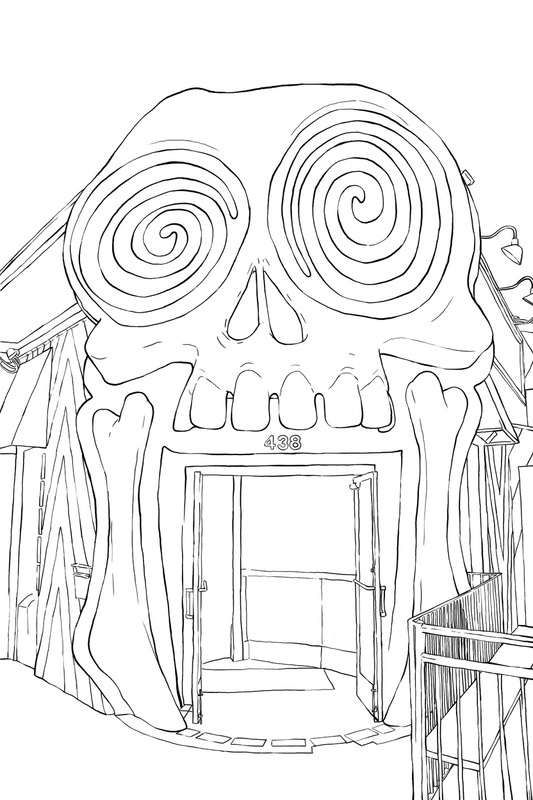 In the mean time, please enjoy this coloring book of one of Atlanta's most recognizable landmarks: The Vortex in Little Five Points. The line has always been too long for me to eat there when I stopped by, but I do quite enjoy the entrance. 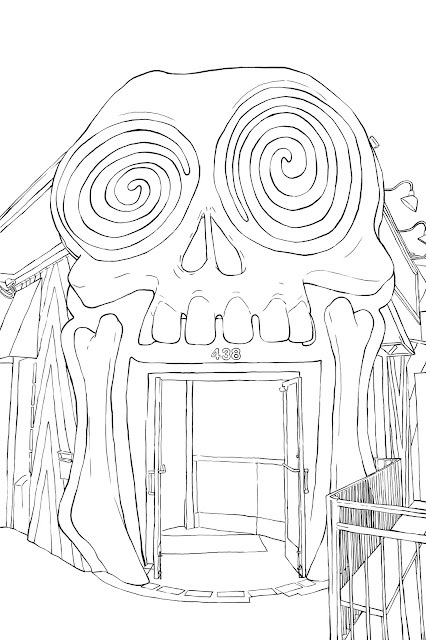 And while I'm at it - this is a little hint about my next coloring book! Be on the lookout in the next couple of month. My spinsterhood allows me to dedicate a vast amount of thought to things other people might only notice in passing. One such thing is my baby dog Mirada's Neck. Miranda's neck is one of my favorite parts about her...well, other than her face, her cute little puppy rump, and her little paws. I pretty much love the whole dog. Well, not pretty much. I do love my whole dog. BUT one of the best parts is her neck. Why, you ask, do I love her neck? Well. She has this loose skin under her neck. Kind of like a waddle, except you can't always see it. It's not just dangling there. Sometimes when she sits up straight on the sofa it looks like she has a double chin, but when she's just trotting about, you can't necessarily see it. But alas. 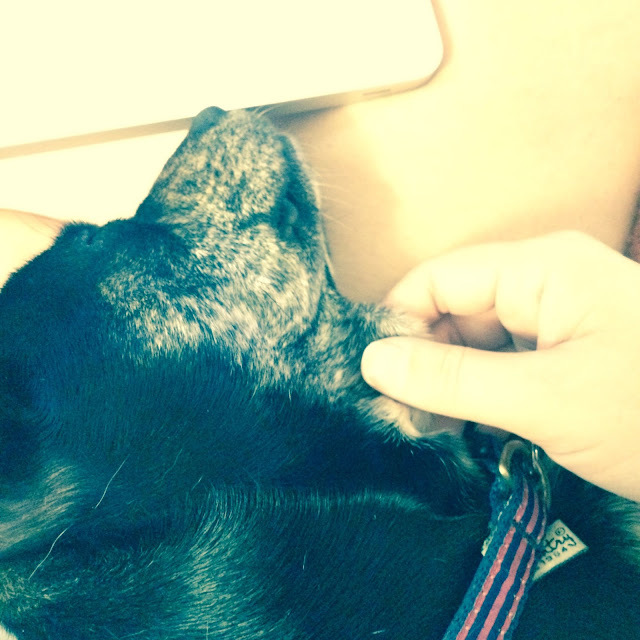 This is one of the best places to pet Miranda. On that loose neck skin. It gives me cute aggression something fierce. Yes, yes. I know. 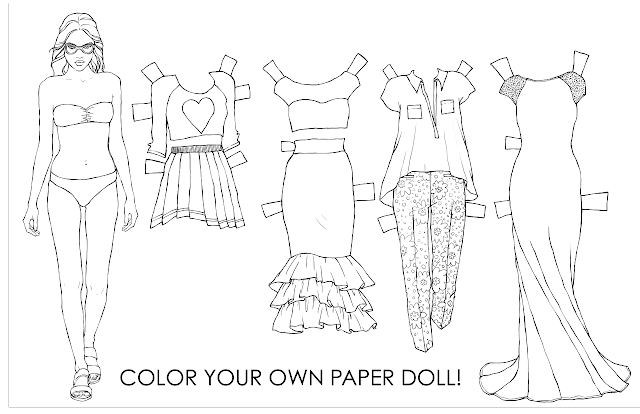 It's another paper doll coloring page. However, I've somehow ceased to have lots of time to think of and make new illustrations. Hopefully I'll share one with you tomorrow. Last night I had two separate dreams where men wanted to date me. Then I woke up. Surprisingly, though, the fellow I informed of my wereraccoonhood has actually requested a coffee date tomorrow night. Perhaps he, too, is a mythical creature. By mythical creature I mean a man who meets my stringent requirements and is also willing to leave me alone about 90% of the time so that I can have my mandatory introvert recharge. My money's on 'no,' thought. In the meantime, I will be having a queso dip date with Miranda's babysitter tonight. I say this to warn you ahead of time I will be out of town for nearly a week starting this Saturday. However, if you're planning to rob my apartment, you're out of luck. Miranda's babysitter is also staying at my apartment. So don't even think about it. 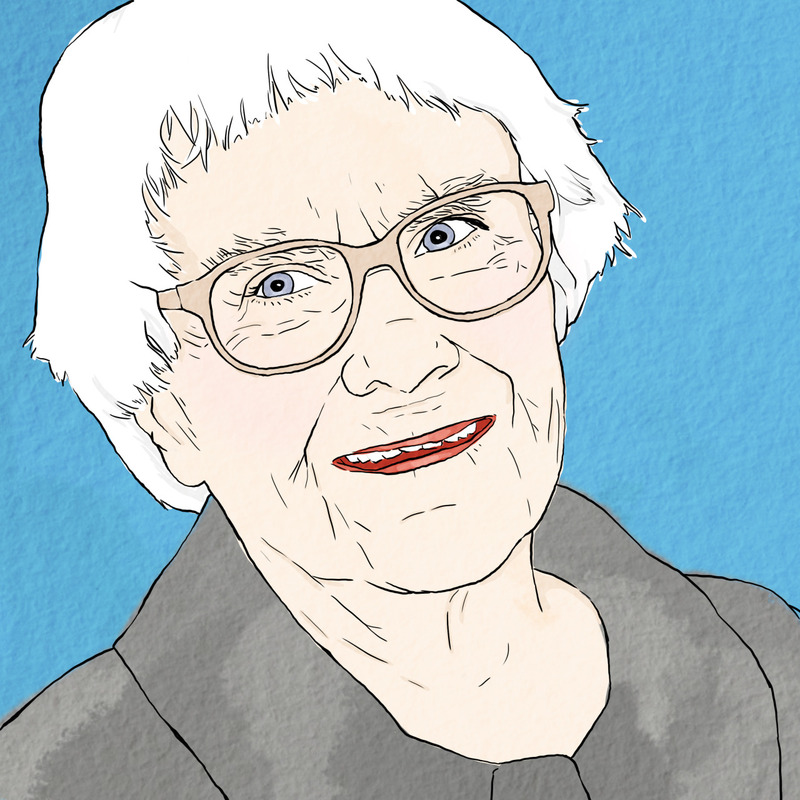 She could murder you just with eye contact and snark. Now, I'm off to pretend that I know how to prepare myself for a day of work. Happy Wednesday! I just ate a bowl of Cinnamon Life and two double stuff Oreos. I'm obsessed with my dog, and last week, when a guy from Hinge asked what I get into on the weekend, I told him trash because I'm a wereraccoon. Stop being jealous of my life, guys. You have your own lives to live. In case you missed it, I found this super weird/wonderful video on YouTube last night. enjoy! I must confess that today's post is very late because of my insatiable desire for sleep lately. I wake up early and then, a couple hours later I already need a nap. I've already had Mono twice, but it's been years. Let's hope it's not here again. Since it's monday, I won't tax your brain. I saw American Ultra this weekend, and it was quite entertaining. I feel like Jesse Eisenberg is good at choosing scripts. However, if language and/or violence bothers you, then this movie probably isn't for you. 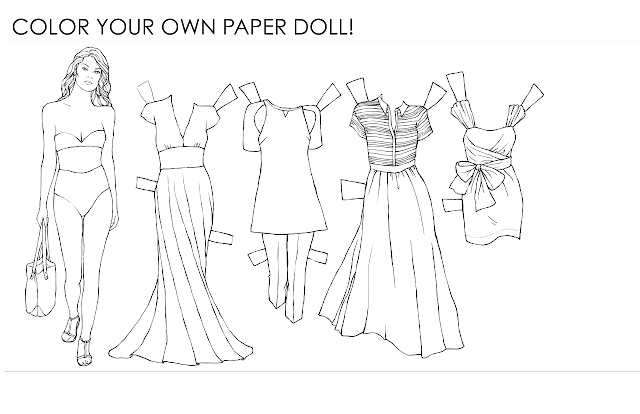 Now, print out this page, color it in, and cut out some paper dolls! It should fit nicely on 11x17 paper. Enjoy! When I was in New York the Sunday before my birthday, I got to spend some time with one of the loveliest people I know. Her name is Phoebe, and she's brilliant. She, like I, is also an introvert. 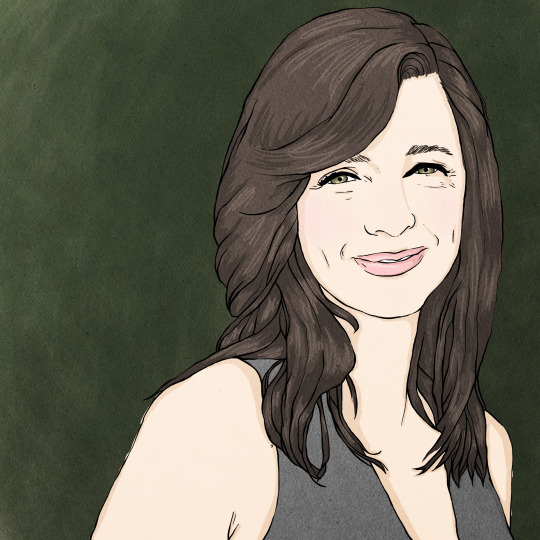 So, when she recommended I read (or, in my case, listen to) Susan Cain's Quiet: The Power of Introverts in a World That Can't Stop Talking, I downloaded it pretty much immediately. Quiet is an exploration of the introvert mentally, emotionally, and even physically. I knew I needed down time, but there were so many other things Cain mentions in her writing with which I completely identify yet never knew had anything to do with my introversion. For example, did you know that introverts are actually physically more sensitive than extraverts? Our tastebuds are often more active, explaining why, for one thing, I don't like coffee. Cain also explains why I always think my dad is watching TV or listening to music at much too high a volume. He's an extravert, and I'm an introvert. I am so impressed by this book, I could say a lot more about it. However, at least of my sake, I really think you should read it yourself, cover to cover. If you don't know me but you have a job or ever deal with other human beings at all, just go pick up a copy. It's really mind-blowingly informative. Hooray for Friday! Add this book to your book club and read it over the weekend. Thanks. Since my post on adult coloring books earlier this week, I found a bunch of coloring pages I made but never posted. Hooray for that! Today I'm sharing one of them for your Thursday enjoyment. 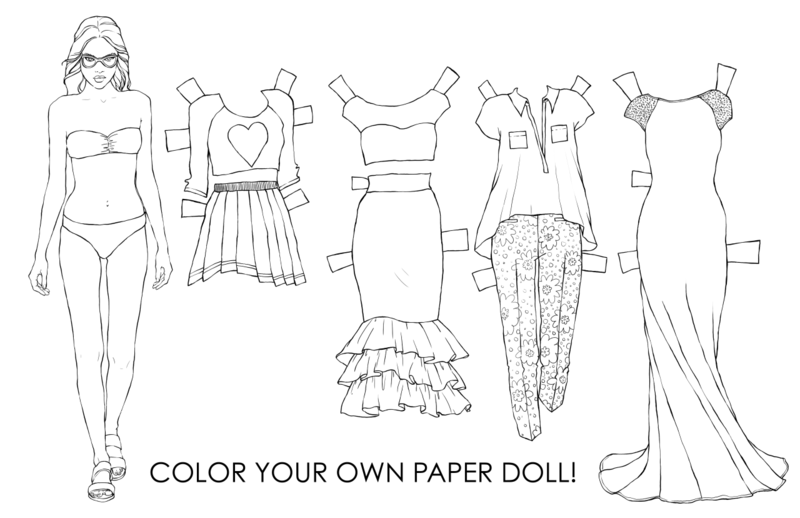 What we have here is a lovely paper doll you can color yourself and dress up in four different outfits (plus her swimwear if you color it that way.) Those are supposed to be sunglasses on her face, by the way. If you click on this image, you can save it. It's made to print on 11x17 paper, but I'm sure it'll do find on whatever size you use. 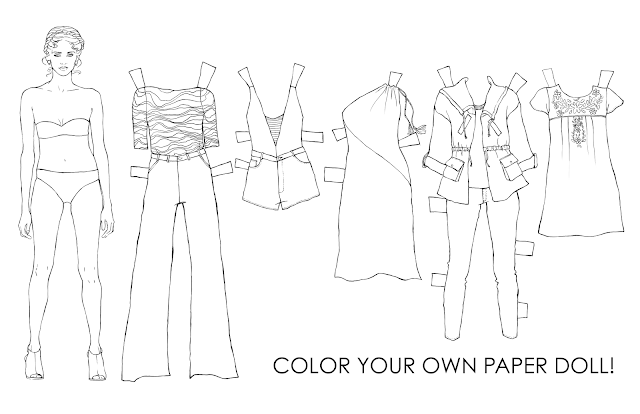 The main point is to color the girl and the outfits, cut them out, and dress her up! Happy Thursday! 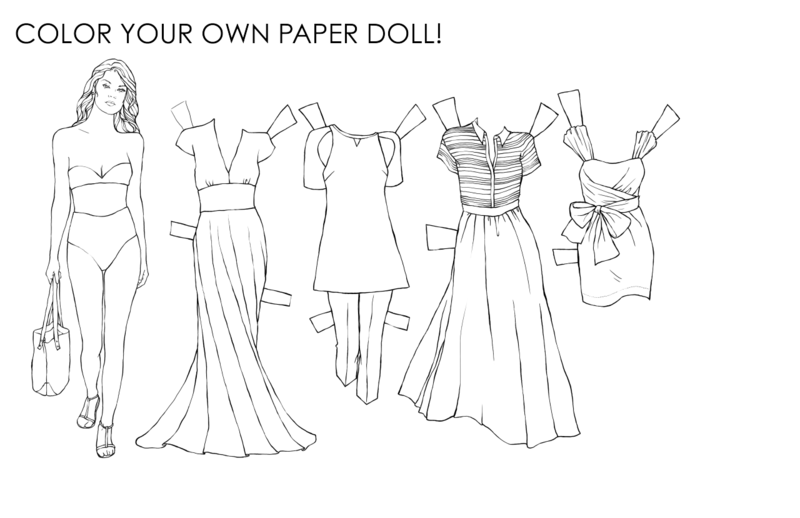 I hope you enjoy your new paper doll! I ate my cereal with a serving spoon this morning. My thirties are off to a great start. I am an adult, you guys, ok? Now, it's been a while since we had a shopping guide, so I think back to school is the perfect excuse! this is actually one of my favorite times to shop. It's more exciting than it is stressful...at least to me. Then again, I'm not starting a new school year, either. Today I've got a collection of things that will help you or your favorite student take some excellent notes, study, or write down when, exactly, that test is. So let's get started! I'm starting off the list with an item I think is probably more useful for the office than for school. Just because you have to file things doesn't mean they can't be cute! Dealing with your mistakes never looked so cute! These will make you feel like a jewel thief every time you open your pencil case. For the Moleskine devotee, these come in really nice colors, including a soft pink. Have you ever looked at the #Moleskine hashtag on Instagram? It's pretty amazing. For those of us who like an old fashioned pencil every now and then, these are a really cute option. Ok, these look amazing. They are markers, and they are erasable? I mean....how am I not going to order a set of these for myself? They'd also be really great for color coding notes or research in college. I like the idea that this has a lot more space for scheduling than you regular planner. I guess you'd keep this on your desk, but the sheer expanse of each day in this book makes me feel a little less cramped. I love that they're making really cute binders now. When I was in school, I feel like this was a fairly new concept, and there weren't that many options. Now, I think most stores make at least some variety of really cute binder, and it makes me want to buy them all. I own two of these. The first one I bought Miranda ate the cap, so I bought another one for when the eraser runs out. Though these are really hard to find, they're pretty excellent. One end is a capped eraser, and on the other end, you flip open a little door, and there's a pencil sharpener that sharpens right into the middle chamber so you don't have to worry about finding a trash can immediately. I highly recommend these. They have them at Binders in a bunch of different colors, shapes, and prints (my first one featured a circus animal), but if you do a little searching, you can probably find some elsewhere as well. 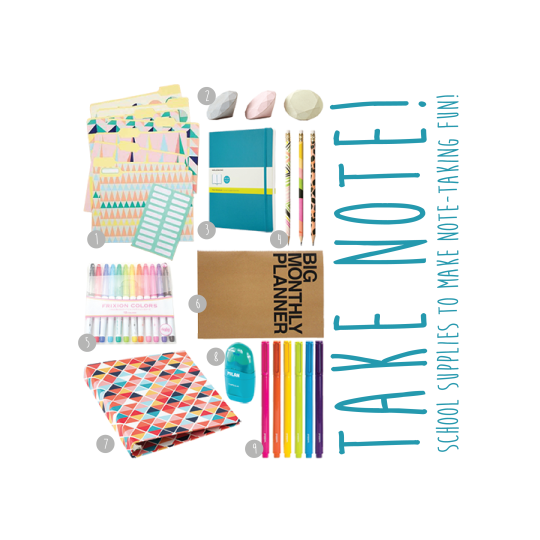 For the color-coded note taker. These are just so clean and minimal. I'll take a set, thanks. Now that you've got all the links, maybe it's time to treat yourself to some fresh office supplies. OR, if you're feeling especially kind, perhaps you should send a supply kit to your favorite college student. I didn't find out there was a movie being released about David Foster Wallace until about a month ago. Then, it was due to hit theaters in a couple of weeks. Well, theaters in New York. It took a couple more weeks for The End Of The Tour to come to Atlanta, but when it did, I saw it that very weekend. Now, I know what you're thinking. Most of DFW's readership is comprised of mansplainers who think a woman couldn't possibly really understand this Infinite Jest. I'll admit that at first they were right about me. I really hate to put that in writing. However, I've said it before and I'll say it again: the longer it's been since I read this book, the cooler it becomes. it just keeps cropping up in every situation - but in my mind, not in conversations with men who doubt my intellectual capacity. I'd heard before that David Foster Wallace was a jerk. Truly, from his reader-hostility in Infinite Jest, I had no problem believing this bit of information. The portrayal that The End Of The Tour offers, though, hit closer to home with my own thought processes and existence than I'd imagine that of a genius ever could. Am I flattering myself, being pretentious? Probably. 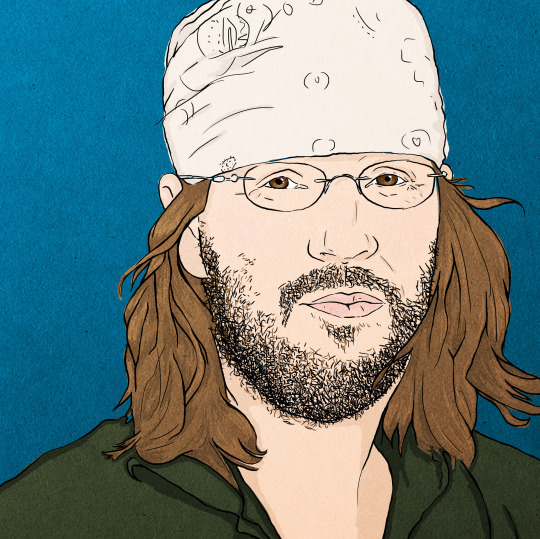 But perhaps the whole allure of David Foster Wallace is actually that he was oddly relatable for someone whose brain was clearly in complete overdrive. After I watched the movie, I decided to do a little research on its accuracy. This mid-90s interview with Terry Gross actually confirms a lot of the dialogue in the movie as truthful. Well, that and the fact that there were the recordings of David Lipsky as well as any number of DFW's nonfiction writings and speeches. As one article put it, "The End Of The Tour is like spending two hours with David Foster Wallace." Truly, Jason Segel kills it. He manages to be both forceful and vulnerable. I can only imagine what it was like trying to unpack all of his lines before deciding how they should be properly delivered. I feel like I need to see the movie three more times before I even hear all the words for what they are. The one thing that I will say didn't really ring true for me in the movie (thought apparently it was true at the time of Infinite Jest's publication) was that everyone seemed to immediately really love Infinite Jest. Like, there's a part where Lipsky is about halfway through reading his own copy and audibly confirms that the book is great. At that point in reading that chunky volume, you've been flipping back and forth between main body text and footnotes so much, you're considering stopping with the foot notes all together. If you have a day job, I doubt you're finding that amazing. Well, at least I wasn't. Then again, reading Infinite Jest on the subway on the way to and from work probably wasn't the easiest way to get it done. Whether or not you like David Foster Wallace's seminal work, I think this movie is really worth seeing. Especially if you have a self-aware propensity toward shoe-gazing or even intellectual pretension. Go see this, but make sure you're in the mood for some thought. It's not light fare. Yesterday, in an unprecedented move, I went to purchase a book in person. Inspired by an interview by Terry Gross, I needed a copy of Diary of a Teenage Girl. Linking it just now, I realized I paid way more than I could have. However, I guess I do want to support authors, so, I don't feel that bad. In my search for a copy of Phoebe Gloeckner's graphic novel, I did come across quite a few amazing adult coloring books. Of course, I had to use the image of one of my own adult coloring books for the post, but there are so many amazing ones out there, I need to share them. Below you'll find a list! 1. Dotta Polka's Vintage Collection. Winner of Amazon's Best of the Year So Far 2015 awards. It's real cute, guys. It's fashion, it's cute animals. What's not to love? 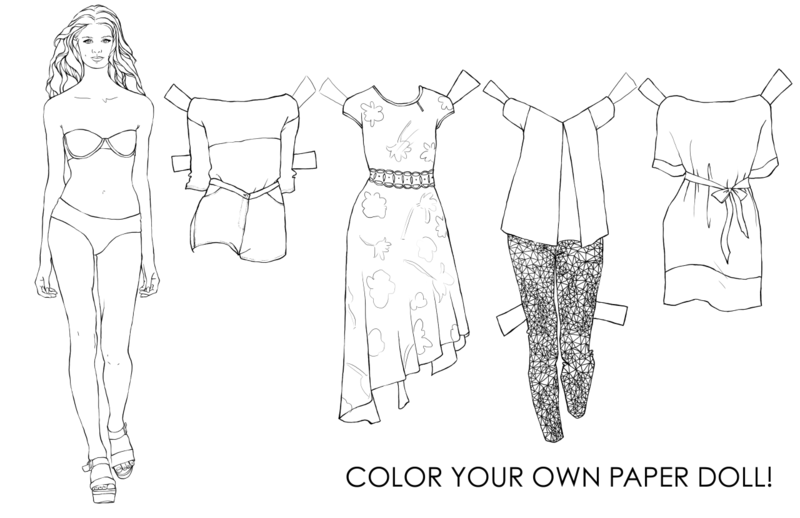 Of course, if you want straight-up fashion animals, then this coloring book is for you. If you just can't get enough of that furniture. I'd like to have this one. Every spinster and/or cat lady should have a copy of this one. The premise is just too good. The title is enough to get that $6.99 out of your wallet. Am I right? Of course I am. Something tells me that people who weren't alive in the 1990s are buying this coloring book. But if you WERE alive, you'll know exactly what color to make that wind suit. I don't know why, but I really love this one. I especially love this one because it's got a bit of foiling on the front cover. I love a little hit of metallic on my book covers. 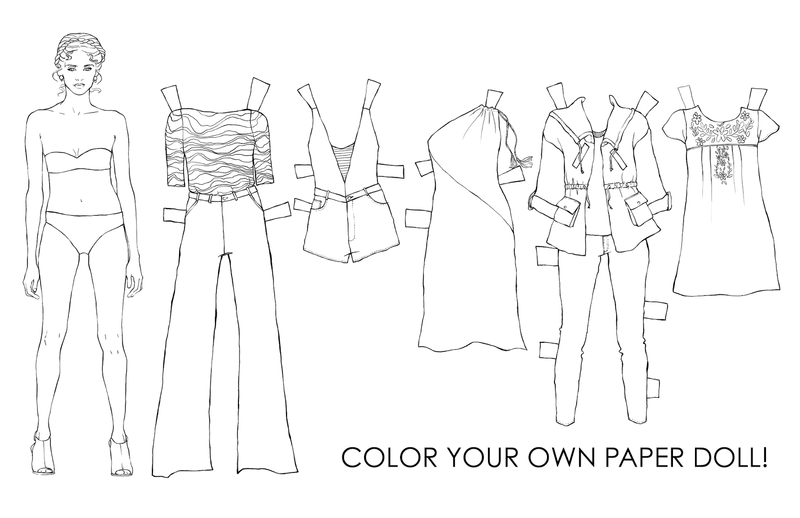 If you need to color some stylish senior citizens, Tavi Gevinson certainly approves. I hope you find something here to love and enjoy! They all look pretty amazing to me! Well, it's happened. I've gone and turned thirty. I can't believe I've been alive this long without figuring out how to be an adult. Case and point: I ate ice cream for breakfast yesterday. But, if it had been my last day on earth, I would have considered that an excellent decision. It wasn't my last day, and still I don't feel that bad about it. In the next thirty years of my life, I expect I may get the hang of functional humanity. It may not happen until my fifty-ninth birthday, but hopefully it will happen nonetheless. Aside from the adulthood, though, there are a few other things I think should happen in the next thirty hers. And so, of course, I've made a list of things I want to do before my sixtieth birthday. Hopefully I can achieve most of them before I turn forty. 1. Ride in the sidecar of a motorcycle. Something tells me this is something I'll only want to do once. That doesn't make me want to do it less, though. If I had a motorcycle, I would obviously get a little sidecar just for Miranda. It's really a crying shame that I'm a professional fashion designer and have never been to Paris. I need to remedy this situation as soon as possible. Since I'd be riding in a big basket, it only seems right I'd also be eating a picnic. I don't know why, but I've always wanted to send out a Christmas Card with an Olan Mills-style photo on it, dressed as dorkily as possible. I should be able to make this happen, but somehow I haven't yet. This doesn't seem particularly urgent, but I really do think Miranda would like to have a yard. It'd be hard to give up the built in maintenance man and swimming pool of an apartment complex, though. Of course, I did live in New York for six years without either, so I guess I'd survive. I'm not sure if I'm even picky about whether the book has words in it at all. It could be a coloring book. I know I've self-published several of those, but I think it would be really cool to have the backing of a publisher. 7. Become a gastro tourist. I would love to take up traveling based on cuisine. Between meals, I'll do whatever I want, but the food would be the main purpose. It's already one of my favorite parts of traveling to a new place, why not just make sure it's a built-in focus? I think this is on pretty much every crafty person's bucket list. I just want to do it. 9. Go on a road trip across the US. I'm not one for tourist attractions, really. I don't need to read any plaques...unless they're about the art of portraiture. Then, I'm afraid I'm going to want to read them all. But that's beside the point. I just want to drive to the west coast, eating everything along the way and hopefully seeing some excellent thrift stores and flea markets as well. 10. Go to the World's Largest Yard Sale. I don't think I'd make it all the way from one end to the other, but it seems like it'd be a lot of fun. There are a lot more things for this list, but I think I may have my work cut out for me. Here's to the next decade and possibly the next thirty years! So, I'm working on my new website right now, and since i'm not great at coding, it's taking forever. Plus, my birthday's coming up, so I'm going to take a break until this time next week. Hopefully then I'll have a bunch of fun, cool photos to show you! When you're an introverted spinster like I am, you've got quite a bit of time to yourself. If you've been following my Instagram (@Jonezee85) lately, then you know I've been using that time to paint a few portraits. In honor of #WIPWednesday (Work In Progress Wednesday), I thought I'd show you what I've been working on so far this week. I've been making quick progress on this painting due to a fit of insomnia I decided to make productive. I sketched out this canvas and started painting the background somewhere between 2 and 4 AM on Monday night. If I'm not gonna get any sleep, I might as well be making something, right? 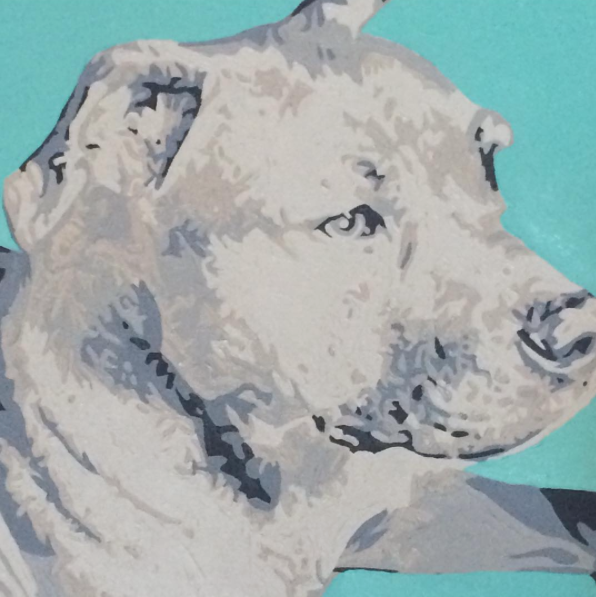 A few months ago, I donated a portrait to Tapestry Public Charter School's fundraising auction. The woman who won the lot was a delight, and yesterday I delivered a portrait of her two sons. I rarely have the opportunity to hand-deliver one of my portraits, so seeing someone take the brown paper off one of my portraits for the first time was really gratifying and exciting. Hopefully soon I'll be able to give you a link to a portfolio website for Portrait information. Until then, you can check out the very-bare Etsy Spinster Store and message me there if you're interested in having a portrait made for yourself! 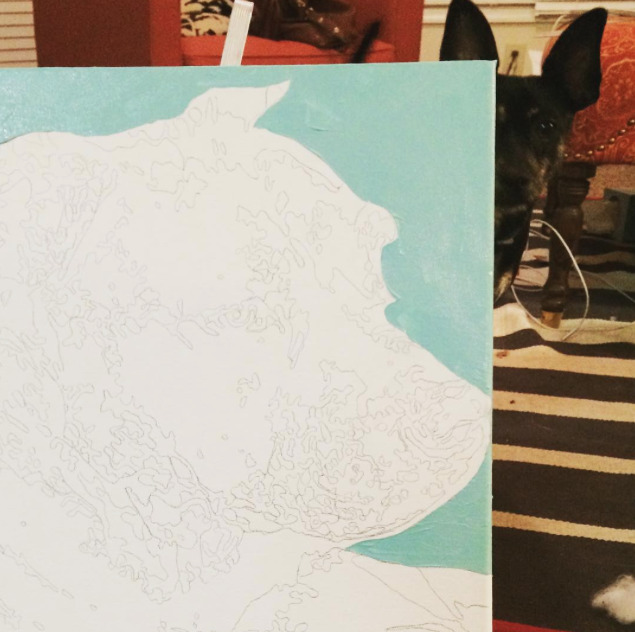 To close out this post, I just have to show this picture of Miranda being curious about what I'm painting. I don't t think I could possibly love my dog any more. Well, hello, and happy Monday! 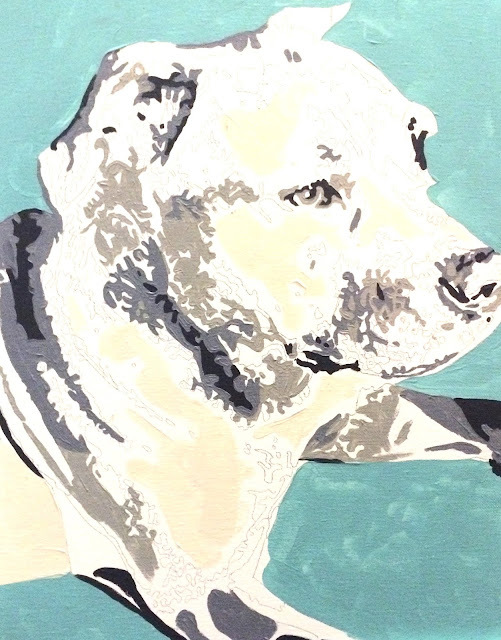 I spent most of the weekend lazing about and working on my most recent portrait. However, I did get some time to doodle on Friday night. So, here you go! 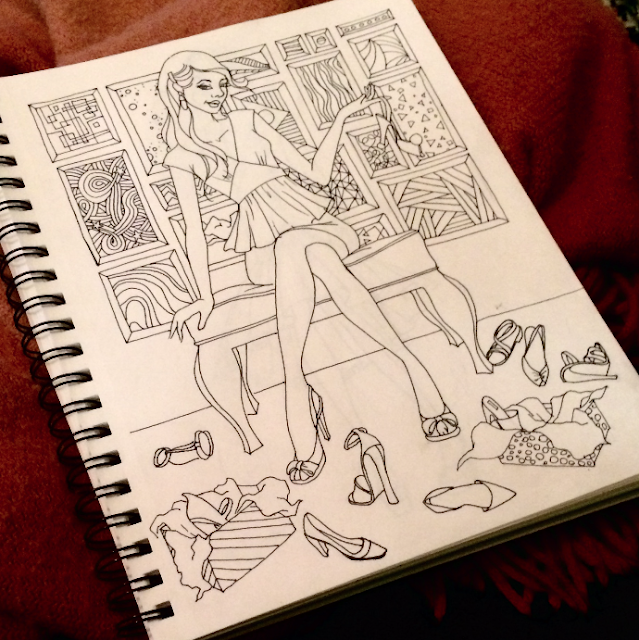 A doodle that will potentially be in the next coloring book. I think it will be fashion-themed. Since this is a Spinster blog, I decided I'd share some links I found while spinstering this weekend. Hopefully, this will make easing into the workday I little easier. 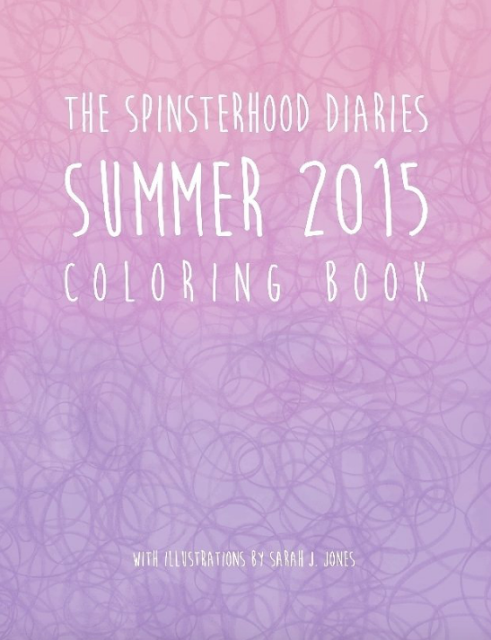 Of course I'd like to populate the world with my own coloring books, but I have to admit this one looks really cute. Pretty much everything in this shop is adorable, but the Cat Lady Club Badge is just perfect for spinsters. Check out this Fox vase, though. Pretty cute, right? 3. Check out these collaborative Drawings with a 4-Year-Old. I love children's art, but this is some next-level stuff. Very cool and very cute. 4. My coworker, Anna, introduced me to #WorkspaceWednesday on Instagram. It's a fascinating peak into other people's working and creative lives. 5. In my new Tumblr life, I happened upon Bouffants and Broken Hearts. Really cute stuff. 6. 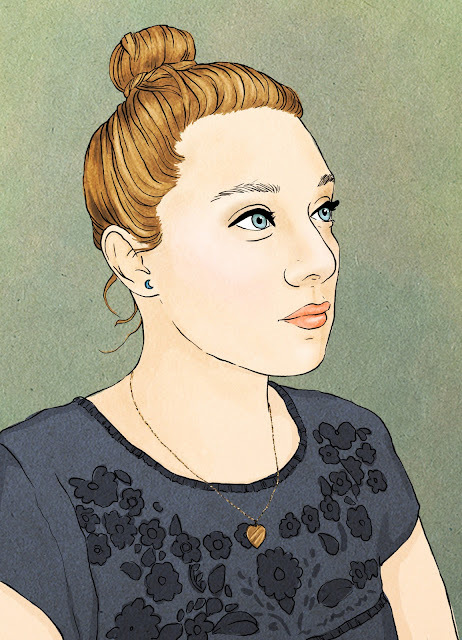 Also in my Tumblr travels, I saw Julia Heffernan who has some amazing illustrations regarding the single life. Among my favorites are "Single Life Meal Plan" and "Staying In Is the New Going Out." So funny, so cute, and so true. Ok...I know six is a weird number, but that's all I got. Happy Monday! Growing up, for months at a time, I would eat the same breakfast every morning before school. I'd eat S'more's pop tarts for six months, and then one day I'd decide I wanted to eat a bagel. 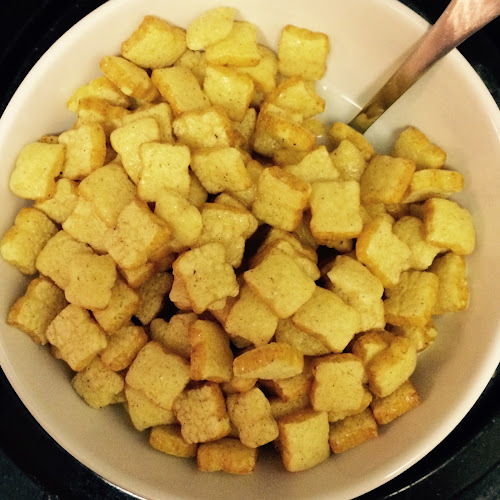 One such breakfast phase was French Toast Crunch. I don't remember how long this particular breakfast lasted, but if I'm judging by the others, I'd say at least a few months. According to it's Wikipedia page, French Toast Crunch was discontinued in the US in 2006. Sometime after that, believe it or not, I actually went looking for a box, not realizing it no longer existed. Of course, I could have gone to Canada, but I didn't even realize that. Apparently I wasn't the only one looking for a box. In December 2004 (again, according to the Wikipedia page), French Toast Crunch was re-introduced to the American market. Of course I didn't know any of this until my friend Sara texted me that she'd bought a box. My first thought was, "I didn't think that existed anymore." So, in Target on Friday night, I saw that not only did they have several boxes for the miniature toast-shaped cereal, but it was on sale! So, of course I bought a box. I'm ashamed to say that I woke up yesterday at 5:45, took Miranda for a walk, ate a bowl of French Toast Crunch, went back to bed, woke up again around 9 and ate another bowl. Yes, I ate two bowls of French Toast Crunch yesterday. I can only hope that soon there's a US women's Sumo Wrestling team. I will gladly join. So, if you haven't fed your spinsterly desires this morning, perhaps you should consider a little mission to the store for a box of French Toast Crunch. It tastes like maple syrup and nostalgia. And isn't that what you want to start your Sunday morning? Back in November I went to Athens, GA to get a puppy. I had no idea I was actually picking out a new best friend. Today, spinsters, Miranda the baby dog turns one year old. I couldn't possibly love her any more than I do. For her birthday today she has already gone on a walk, taken a nap, eaten some cheese (her favorite), played with a tennis ball, and she is currently squeezing the squeaker in her brand new raccoon toy. Later I'm going to take her to play with the other dogs so she can spend her birthday with some other kids. My own birthday is now 12 days away (if you count today), and since I'm turning much more than just one year old, I decided I should share some wisdom with Miranda on her birthday. Below you'll find a list of things I've learned in my nearly 30 years that I think she should know...whether she can actually use them or not. 1. Unless you work in a nail salon, you'll never finish a bottle of nail polish. This is just one of the rules of the universe. I have never used every drop of polish in a bottle, and I doubt I know anyone who has. It's just the way of the world. 2. There is a serious difference between fresh squeezed orange juice and the kind you buy already packaged. Fresh squeezed is leagues better, and somehow it's never been replicated in mass production. The closest I've come is at Pret-A-Manger, and still...I was suspicious. 3. Walking faster is best achieved by taking longer steps, not faster steps. Once you get used to the longer steps, you aren't exerting any more energy to walk faster, and smaller steps seem like unnecessary cardio. 4. 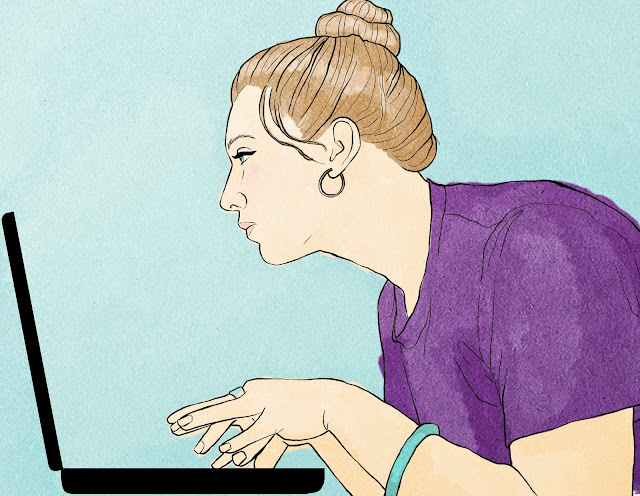 Resist the urge to find out what old boyfriends are doing. It doesn't help you in any way. Seriously. If there's one thing I've learned being single this long, it's to avoid knowing any details of the old boyfriend's life until you're over him. Stalking him on social media and seeing that he's on a date with someone else only hurts you and doesn't affect him at all. Believe me, he doesn't feel guilty, no matter how much you think he should. So just...unfollow. 5. The fattier the chocolate milk, the better it tastes. This is just a rule of the universe. Whole chocolate milk tastes, like, a million times better than fat free. If you're gonna go, just go all out. Now, I'm pretty sure Miranda can't use any of that advice, but maybe some other spinsters out there will get a good little giggle out of it. Here's another picture of Miranda for the road. She's just the cutest baby I've ever seen. Happy Saturday!